As before, I emphasize here that I'm not trying to diminish the significance of these innovations in human culture, just argue against the misconception that these whistled versions of languages are in fact languages in themselves. I'm thrilled that people have caught on to the cultural value and worked to preserve them, and furthermore whistled language provides fertile testing grounds for hypotheses about the comprehension of language, like the lateralization study in Current Biology conducted by Güntürkün, Güntürkün and Hahn cited in the New Yorker. And there are multiple places in the world where a whistled version of a language has developed, for obvious adaptive advantage (hard-to-cross mountains and/or thick forests.) But whistled languages are not distinct languages. 1. Whistled communication is never used as the primary method. People use Silbo to call across canyons to each other (effective and clever) but there was no report of the ear-splitting sound of story-tellers around the campfire (because then they were speaking normally.) I place this claim first because reports of whistled Turkish state that it was used in non-work settings, which on its face would seem to undermine my argument. BUt this loses sight of why it matters whether people use whistled Turkish in more than a few restricted settings - because there is still no such thing as a first-language whistle-language speaker, and certainly there never has been a monolingual. At best, this makes it a pidgin, like Chinook Jargon or Russenorsk. 2. Whistled communication is a whistled version of a primary, "normal" spoken language. If a whistled language is distinct, then when we whisper in English next to each other, that would count as a separate language as well. And of course it doesn't - it's a restricted, rarely-used, context-specific form of communication which makes some phonetic sacrifices due to its usefulness in that setting. 3. Can you learn the Turkish whistled language without learning Turkish? No. Granted, a first-language Turkish speaker might not understand it at first, much like you didn't understand Pig Latinthe first time you heard it. But you can learn Pig Latin - only if you know English first. No comment on how this bears on my (partly tongue-in-cheek and now mostly abandoned) cultural affinity argument about whistling in other Altaic languages. There has been some gnawing of tongues on the topic of IQ. Here I'm not talking about its very existence, which isn't open to debate (it's very real - disagree? Then you, Barack Obama, and Donald Trump are equally smart. I thought so.) It's that some people - young people, mostly - seem to be scared to find out what their IQ is, because it might not be as good as they would like, and then their life would be ruined. These people are assuming a high degree of determinism. Yes, IQ is important (go to the link above and follow the links.) But at the same time, Warren Buffet has said that if you could trade every IQ point above 120 for money, you should. The greatest chess player in history Magnus Carlsen has said that too-high intelligence has been a handicap to some of his predecessors, who got distracted by other endeavors. Jeff Bezos of Amazon studied undergraduate physics at Princeton, noted how much harder he had to work than some of his peers, and switched out. What are we to make of this? Let's start off by assuming that IQ is completely determined by factors out of your control, and furthermore completely determines your future. That being the case, learning one's IQ has been likened to being handed an envelope with your date and manner of death inside. Anxiety-provoking? Sure, just like getting the result of an important test back - which, by the way, is invariably the direction the discussion goes, and no, no one likes the day the envelope comes, but everyone would be very upset if one year the nice people at ETS decided to rip up all the tests and give everyone an average. And just like the day you get your test results back, the only possible rational answer to whether you would want to know your death date is YES, and when people actually have such a choice in real life, they almost invariably DO want to know it. Cryonics crowd aside, you already KNOW you're going to die. You even have a rough idea of about when it will happen, statistically. You don't know what from, but you can make some guesses. When someone receives a terminal diagnosis, now they DO know what they'll die from, and they have a much narrower statistical window on when. So put yourself in this position: your doctor has just told you that you have pancreatic cancer. What is your VERY NEXT THOUGHT? "How long do I have?" You'd be pretty angry, and justifiably so, if she told you "I typically don't tell people the life expectancy because they might not want to know that." Two specific reflections on this. 1) While genetics is the single greatest determinant of IQ, it is not the be-all end-all deterministic measure that many fear it is. In particular, "smart" may correlate with, but does certainly not equal, happy, moral, or successful, and furthermore there is an endless list of capacities, tendencies and talents that may correlate somewhat, but certainly not entirely, that determine the chances of success in various paths in life. I suspect that Peterson's unidimensionals get most upset in the U.S., where we most resent anyone telling us that any characteristic outside of our control has any influence over our future, despite the obvious reality. Think of the trigger points in these discussions: race, socioeconomic class, upbringing, genes, the wiring in your brain - somehow the second we turn 18 we should be able to leave all the behind and emerge as an un-caused cause, right? (I wonder how much of the hostility to the very concept of IQ stems from this kind of thinking.) 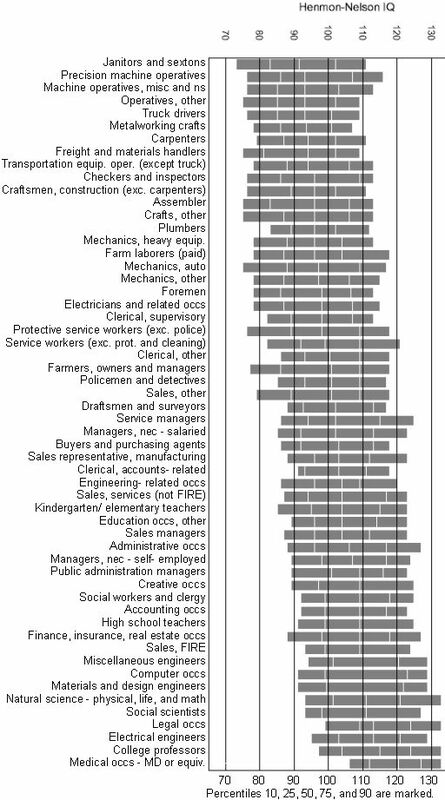 Below I've reproduced a figure in the Vox article (which in turn is reproduced from elsewhere) but what's interesting is how broad some of the bars are. What a broad bar should tell you is that there are more people in that profession (more outliers in absolute terms), and/or that IQ isn't as important. Case in point, protective service workers - intelligence appears to be less of a determinant there than for some of the others. I would expect ability to remain calm and vigilant and tolerate distress is at least as important. To the extent that IQ is a proxy for achievement, happiness, and self-worth, then just go try to do the things you're worried about and you will get rapid feedback - i.e., Scott Aaronson's recommendation that you just go try to do physics. "But what if I fail?" Think about it this way. How many people have actually said, "You know, if only I had an IQ test, I would've known better, and I wouldn't have made this massive career commitment that I now can't retreat from without massive damage to my finances, freedom, etc." But - interestingly - people certainly do say things like "If only I'd known X about myself, I would've chosen a different career," where X is something about your utility function, like the value you place on time vs. money vs. freedom, security vs. opportunity, ability to get along with certain personality types, etc. The key is to learn about your own many dimensions and find your selective advantage. How sad is Jeff Bezos that he couldn't keep up with the physics students at Princeton? If a genie told me I was going to die on a certain date and time from a certain thing, I would enjoy making life difficult for fate. Shark attack in 2022? I will move to the Mojave desert and not come out. Yes, I know, something will happen with a great white shark being transported by air between aquariums, and the plane will blow up and the shark will fall on me or something, but I'm really really going to make the universe work for it. I would grant my wife exclusive rights to my story in advance. While knowing your death date would help you plan, it would mess up the possibility of insurance, assuming everyone gets such an envelope and knows that everyone else does. If you're still not convinced that you shouldn't be crushed by your potentially low IQ, then consider that many people smarter than you and me both believe that by the end of this century, machines of far greater intelligence than any human who ever lived will exist, and none of the at-that-point meaningless differences in processing power between us flatworms will matter anymore. In a forum discussion I once referred to academia, medical schools, etc. as "clubs for smart people" and was immediately told "NO. Those are clubs for people with IQs 120-130." Yikes! I guess this particular Einstein had just cured cancer AND made a killing in the stock market that morning so they had time to police the forums for claims like this. At srconstantin.wordpress.com, Sarah attempts to explain forgiveness. Although it wasn't exactly what her post was about, it prompted me to write down in a comment something I'd been pondering for a while. There are non-mysterious, rational, game-theoretic reasons for forgiveness, and the post I linked to is more about those. For example, if someone makes a mistake or takes an action and then changes her mind about it when she sees the consequences, their past behavior is less likely to predict their future behavior in similar situations. If she apologizes in that situation, when you "forgive" her, you're really saying "I recognize your regret, and I'm not that worried that you'll do it again, so don't worry about it" and also "I'm not angry and therefore you don't have to worry about my trying to harm you right now or in the future." Imagine if someone backs into your car in a parking lot, then stops to look at what happened, is horrified at what happened and apologizes. Forgiving this person would be of this type. There's an internally, psychologically adaptive function to forgiveness as well, and it's the dirty little secret of this otherwise proud aspect of being human. When you say "I forgive you" to someone who's wronged you - perhaps in a way that harmed you irreparably - you're at least partly saying, "What you've done is insignificant enough that I can put it out of my mind." You're declaring dominance over the other person in a way, and this is why once accomplished, forgiveness makes you feel better. The strongly negative reaction I often receive when telling people this, is very similar to the reaction you get when you're pointing at other status-signalling behaviors that everyone would rather not think about as such. Depression is related to lack of forgiveness, so this stranger kind of forgiving could be partly protective. If in fact forgiveness is just covert dominance display, then you could also explain depression related to not-forgiving partly as a result of lost social status associated with being the victim of a crime. Interestingly, in legal proceedings, this expression of forgiveness occurs at sentencing - which is interesting for two reasons. First, it provides the maximal audience, and would therefore be the best place to announce something that is expected to change social status. Second, this is the concrete expression of the aggressor's material punishment. If the aggressor was really being forgiven, wouldn't the forgiver ask for the charges to be dismissed? (In fact I can't think of an occasion where someone has forgiven an at-large murderer of a family member; if they exist, certainly they're more rare.) Furthermore, the language accompanying such forgiveness, by the forgiver or their audience, is about "rising above" the situation or aggressor - showing superiority to them. Also supporting this idea, it's also notable that unrepentant wrongdoers who are forgiven in this manner often react poorly to the display of forgiveness. This originally appeared in my trip report from the Canary Islands. And another set of arguments against whistled versions of languages being considered separate languages, this one regarding "Bird Language", a whistled version of Turkish. Silbo, the whistled "language" of La Gomera, is clearly a remarkable part of the Canaries' unique heritage, one that I hope continues to exist far into the future. You can listen to examples here, here and here. I emphasize this because my argument that it is not a language is not an argument to diminish its significance in this regard. But language is a strong interst of mine - I almost went back to school to study linguistics - and Silbo is not a language, and I've carefully referred to it as a "communication system" for this reason. (If you run across this blog post and you have counterarguments or evidence to the contrary, I'm not a Silbo expert, so by all means educate me!) Canarians are of course proud of their heritage and it's difficult to receive criticism of a belief about something so central to cultural identity as language, and we've encountered this problem right here in the U.S. (see #2). Here is why Silbo is not a language. 1. Silbo dates to the days of the Guanches. Guanche was a distinct language, unrelated to Spanish. As a Berber language, Guanche likely had a very restricted set of vowels, uniquely suiting it to a whistled form which by some estimates has only two vowels (as linguist Ramon Trujillo argued in his 1978 book.) Yet the modern version of Silbo is clearly whistled Spanish. The ability to translate Spanish (or any language) into a whistle, and have someone understand any of it, is remarkable. But this shows that Silbo is a manner of intonation of an already-understood language, not its own language. (If you object: can someone from Germany learn Silbo, but not learn Spanish? If two German-speakers in Switzerland start whistling German to each other across the valleys, is that Silbo, and could someone from La Gomera understand them? The answers are no and no. It's not its own language.) I would like to see sets of "blinded" participants communicating to see what the lossiness of Silbo is - I predict much more than actual language. Normal spoken language is about 50% redundant. 2. Silbo is used in very limited circumstances - to call long distances across valleys (for which it's a brilliant innovation), and to discuss very limited topics of obvious immediate import (where are my sheep, is it going to rain, etc.) No ritual oration has ever been given in Silbo, no political discussion, no business deal (unless it was a very simple one across a valley involving something immediately present like sheep. Note that in one of the links above they're talking about red wine, etc. ; this is a tourist performance, and no one is actually communicating.) True languages are used constantly, in every social setting. You have to work hard not to use them, and children exposed to them start developing language at a young age, without any special effort to teach them. I would be shocked to learn that children of four are whistling without being specifically taught, and I also have not read any traveler, ancient or otherwise, reporting the ear-splitting qualities of conversation in a village of La Gomera - because people speak. An example of a language-like entity that has become culturally important here in the U.S. is what people call Chinook, but is really Chinook Jargon. It's a trade pidgin, a mish-mash of true Chinook (a real language), English, and some Russian, Spanish and French. It has little to no morphosyntactic structure, is not learned by children, and is not spoken outside of trade settings. Nobody goes home and speaks Chinook Jargon to their wives or husbands, they speak Chinook, or English, etc. and that's what the children learn. The children may grow up and learn Chinook Jargon - as adolescents or adults, by deliberate effort. So as with Silbo, Chinook Jargon is a fascinating and important part of the Pacific Northwest's history and heritage, and I wish its enthusiasts well - but it's not a language.